Berikut ini adalah Soal Direct Indirect Speech dan Kunci Jawaban Part 2 setelah sebelumnya saya bagikan Soal Direct Indirect Speech dan Kunci Jawaban Part 1. Mengingat materi ini bisa dibilang gampang-gampang susah. 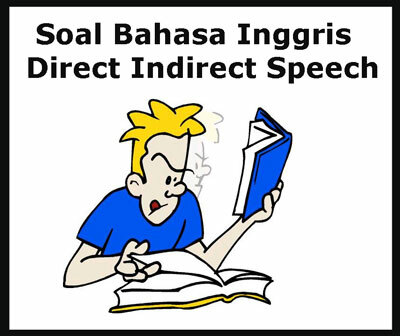 Oleh sebab itu saya kelompokkan soal menjadi dua bagian yaitu Soal direct indirect part 1 tentang statement of direct indirect dan yang sekarang ini adalah soal Direct Indirect Speech from Question dan Direct Indirect from Imperative. Question Sentence atau kalimat tanya dalam bahasa Inggris dibagi menjadi 2 yaitu Question Sentence dengan jawaban YES/NO dan Question Sentence dengan menggunakan Question Words (kata tanya). Jika kalimat pertanyaan dalam Direct Speech dengan jawaban YES/NO, maka kata sambung (Conjunction) yang digunakan adalah IF/WHETHER (Apakah). Jika kalimat pertanyaan dalam Direct Speech menggunakan Question Words, maka kata sambung (Conjunction) yang digunakan adalah Question Words itu sendiri. 1. Jeffry asks me," Are you really happy and glad right now?" 2. He asks them," Will I be there next Monday?" 3. Andy asks her," Do you hope to be my close friend?" 4. Danu asks her," Did you go to my brother's house with my sister?" 5. She asks," Will you give him your sweet chocolate?" 7. You have asked me," Have we been here?" 8. Tom asks Jerry," Were these ours?" 9. Joni has asked Jihan," Would you take my magazine there?" 10. A policeman asks us," Did you see a man passing this way?" 11. Aisah asked," Would you leave me alone?" 12. Jeremy asked her," Have you arrived at Cichago?" 13. He asked his mother," Am I going to buy a new computer?" 14. Rania asked them," Is your friend my friend also?" 15. He asked me," Could you answer my teacher's question about English grammar?" 17. Mother asked me," Are you selling your cycle here now?" 18. Julia asked them," Would you bring my big bag yerterday?" 19. She asked him," Don't you know my name?" 20. Aunt asked uncle," Must we bring this suitcase?" 21. Mother asked father," Had you come on time yesterday?" 22. I asked my sister," Have you found my purse?" 23. She asked them," Is it for us?" 24. Budi asked me," Are you going to Surabaya today? 25. He asked her," Will she recognize my brother tomorrow?" 27. Doni asked her," Could they solve my homework yesterday? 28. Riana asked Fauzan," Do you think that I have brought your book?" 30. I asked him," Will you remind her if she comes here?" 1. Afi Nihaya asks them," When will you understand me?" 2. She asks them," Why do you always judge me?" 3. Romeo asks Juliet," Why must I sing a song for you?" 4. She asks to me," Who is reading a novel in my garden?" 5. Fadil asks Ben," How many pictures do you save in your galerry?" 6. Tiara asked," Why do you love me?" 7. They asked," Which one was your new dictionary?" 8. Nancy asked her brother angrily," Where have you hidden my letter?" 9. I asked Teddy," How many people arrived here last Monday?" 10. He asked her," When you give back my wallet?" 11. She asked him," When will you give me money?" 12. Ilham asked," Where did you sell my bike two days ago?" 13. The prince asked," Where is my soulmate now?" 14. The hadsome man asked me," When can I marry you?" 15. She asked him," Which scedule do I have to remember?" 16. He asked," What is your best experience in your life?" 17. He asked me," Where did we live last year?" 18. She asked him," What were you looking for here?" 19. She asked him," Where must you meet me?" 20. She asked him," What are you doing in my room?" Imperative of Direct Indirect adalah kalimat dalam Direct Speech yang berupa kalimat perintah (Command) atau kalimat permohonan (Request). Kata sambung (Conjunction) yang digunakan adalah TO (untuk kalimat perintah possitive) dan NOT TO (untuk kalimat perintah negative). Pronoun dan adverb aturannya sama dengan aturan-aturan perubahan dalam Direct Indirect Speech from Statement. Sedangkan Tenses Imperative of Direct Indirect tidak mengalami perubahan. 1. Jowiya says," Be quiet!" 2. Leni says to Rafi," Don't touch me now!" 6. Amanda said to me," Come to my house tonight!" 8. Father said," Be good student and reach your dream!" 9. Mother says," Don't help her again!" 10. He asked," Give me applause!" 11. My teacher asked," Be ready to reach your future!" 12. Yoga said to her," Don't be angry with my statement!" 13. My mentor said," Be confident because you can!" 14. The director says," Call the managers for a meeting now!" 15. He said to everyone," Give me a new car!" 16. My aunt said," Let's visit my place!" 17. He asked," Don't disturb this girl again!" 18. She asked them," Help your friends today!" 19. He asked her," Let me sit beside you!" 20. She said," Think smart before you do it!" 1. Jeffry asks me if I am really happy and glad right now. 2. He asks them if he will be there next Monday. 3. Andy asks her if she hopes to be his close friend. 4. Danu asks her if she goes to his brother's house with his sister?" 5. She asks if I will give him my sweet chocolate. 6. He asks her if she is thirsty now. 7. You have asked me if we have been here. 8. Tom asks Jerry if these were theirs. 9. Joni has asked Jihan if she would take his magazine there. 10. A policeman asks us if we see a man passing this way. 11. Aisah asked if I would have left her alone. 12. Jeremy asked her if she had arrived at Cichago. 13. He asked his mother if he was going to buy a new computer. 14. Rania asked them if their friend was her friend also. 15. He asked me if I could have answered his teacher's question about English grammar. 16. She asked if I always saved my money in the bank. 17. Mother asked me if I was selling my cycle there then. 18. Julia asked them if they would have brought her big bag the day before. 19. She asked him if he didn't know her name. 20. Aunt asked uncle if they had to bring that suitcase. 21. Mother asked father if he had come on time the day before. 22. I asked my sister if she had found my purse. 23. She asked them if it was for them. 24. Budi asked me if I was going to Surabaya the day. 25. He asked her if she would recognize his brother the next day. 26. He asked me if I Might have know him the Sunday before. 27. Doni asked her if they could have solved his homework the day before. 28. Riana asked Fauzan if he thought that she had brought his book. 29. The cute girl asked Romi if his friend would lend her money. 30. I asked him if he would remind her if she came there. 1. Afi Nihaya asks them when they will understand her. 2. She asks them why they always judge her. 3. Romeo asks Juliet why he must sing a song for her. 4. She asks to me who is reading a novel in her garden. 5. Fadil asks Ben how many pictures he saves in his galerry. 6. Tiara asked why I loved her. 7. They asked which one had been my new dictionary. 8. Nancy asked her brother angrily where he had hidden her letter. 9. I asked Teddy how many people had arrived there the Monday before. 10. He asked her when she gave back his wallet. 11. She asked him when he would give her money. 12. Ilham asked where I had sold his bike two days before. 13. The prince asked where his soulmate was then. 14. The hadsome man asked me when he could marry me. 15. She asked him which scedule he had to remember. 16. He asked what my best experience was in my life. 17. He asked me where we had lived the year before. 18. She asked him what he had been looking for there. 19. She asked him where he had to meet her. 20. She asked him what he was doing in her room. 1. Jowiya says to be quiet. 2. Leni says to Rafi not to touch her now. 3. Dodi says to Nina not to go without him. 4. Nicko tells Rafa to do what he wants. 5. Alfina says to her brother not to be lazy to study. 6. Amanda said to me to come to her house that day. 7. Diana asked me not to forget to bring my book the next day. 8. Father said to be good student and reached my dream. 9. Mother says no to help her again. 10. He asked to give him applause. 11. My teacher asked to be ready to reach my future. 12. Yoga said to her not to be angry with his statement. 13. My mentor said to be confident because I could. 14. The director says to call the managers for a meeting now. 15. He said to everyone to give him a new car. 16. My aunt suggested visiting her place. 17. He asked not to don't disturb that girl again. 18. She asked them to help their friends that day. 20. She said to think smart before I did it. 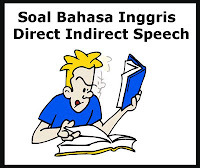 Itulah Soal Direct Indirect Speech dan Kunci Jawaban Part 2. Semoga bermanfaat. Mohon koreksinya jika ada kesalahan. Terima kasih.